The British Embassy, Warsaw together with the Polish Office for Foreigners held a ‘Community Connect – #BritsInPoland’, event in Kraków on 21st March 2019. UK Embassy staff provided essential information at the meeting about the UK’s exit from the EU, whilst representatives of the Polish Office for Foreigners gave an update on the rights of UK nationals living and working in Poland. The event was concluded with a lively question and answer session. Message from Deputy Head of Mission. 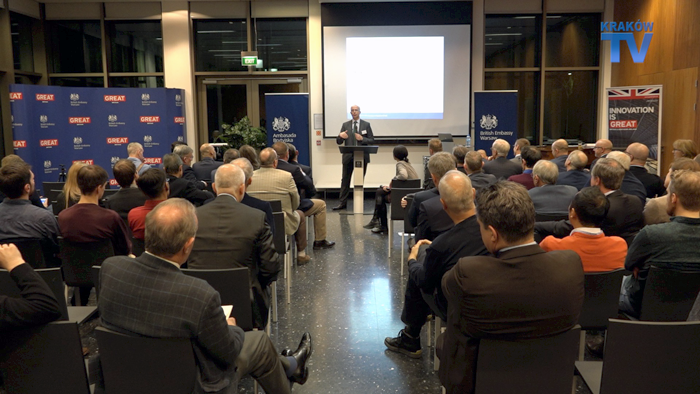 Jason Rheinberg, Deputy Ambassador, at the British Embassy in Warsaw, gave a short message for those unable to attend the event. Check out our BREXIT Information & Resources for UK Nationals in Poland for all the latest Brexit news & updates in one place. Representatives of the Polish Office for Foreigners, gave a detailed presentation on the requirements set out in the draft law regarding UK Nationals rights in Poland in the event of UK leaving the EU with an agreed deal, and particularly requirements in the event of a No Deal Brexit. Details of their presentation are included below. We’ve updated our Brexit Countdown Clock to show the next possible Brexit date – 12th April 2019, we suspect we may be changing it again soon!